This recipe is a very special one, made for a very special occasion in Korean culture. 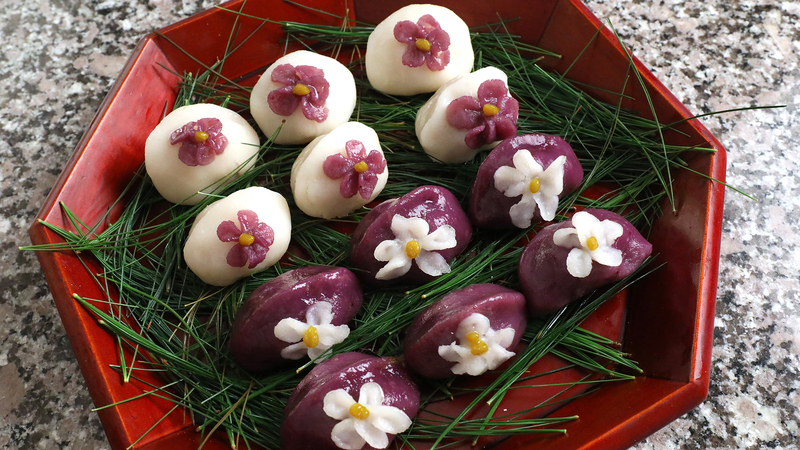 It’s rice cake called songpyeon, which Koreans make for Chuseok, the Korean harvest moon festival. On that day, Koreans traditionally give thanks for the harvest and make songpyeon with the new rice from that years’ crop. Songpyeon is a little sweet, chewy, and nutty, with a subtle pine tree flavor that from steaming the rice cakes in fresh pine needles. For this recipe you’ll need ssalgaru: 쌀가루 (aka mepssalgaru: 멥쌀가루, or short grain rice flour), a special kind of rice flour made from finely milled rice, soaked in water for hours. The rice flour is a little wet, so to keep it from spoiling it’s sold frozen in the Korean grocery store. Be careful not to buy chapssalgaru (찹쌀가루) which is also sold in the freezer section at a Korean grocery store. Chapssalgaru is made from sweet rice (aka glutinous rice) and it won’t work for this recipe. If you can’t find ssalgaru you can make your own with my recipe. I used all natural food colorings to make this songpyeon, including the water from yellow gardenia fruits (chija) to make the yellow dough. I crushed a few gardenia fruits, added a few tablespoons of water and let it sit overnight. By the morning the water had turned a dark orange yellow. If you can’t find gardenia fruits, you can substitute it with orange Jell-O powder. Just mix some powder with water. You can also do some creative experiments to create your own colors. I often use mugwort powder for green, and you could try strawberries for red. For filling, toasted sesame seeds, fresh beans, pine nuts, and sweet mung bean paste are usually used, but you can try to create your own fillings, too! I hope you enjoy this recipe, which I first introduced to you nine years ago! I remade the video in HD and rewrote the recipe, just in time for Chuseok this year. 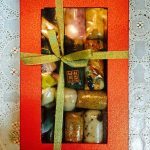 Happy Chuseok, and enjoy some songpyeon! Combine 1½ cup rice flour, ¼ teaspoon salt, and ¼ cup hot water in a bowl and mix it with a spoon until the dough is cool enough to knead by hand. Knead for about 1 minute until smooth. Roll it into a ball and wrap it in plastic wrap. Set aside. Put a little more than 2 tablespoons rice flour and 1½ teaspoons gardenia fruit water into a small bowl. Mix it with a spoon and then roll it into a ball with your fingers. Wrap it in plastic wrap and set aside. Place 1½ cup rice flour and ¼ teaspoon salt in a bowl. Set aside. Heat a thick pan over medium high heat and add blueberries. Press and break the blueberries with a potato masher (or a large wooden spoon) as you cook them, until all the berries are broken. Let it bubble for a few minutes, stirring with a wooden spoon. Remove from the heat. Put it into a mesh strainer over a fitted bowl. Press down and stir it with a wooden spoon to strain. You will get around 3/4 cup of hot blueberry liquid. Add ¼ cup to the rice flour. Mix it with a wooden spoon until the dough is cool enough to handle by hand. Knead the dough for about 1 minute until smooth. Put the beans into a small bowl and mix with 2 teaspoons honey. Fold the the pine nuts into a piece of parchment paper on your cutting board. Pound the nuts through the paper or roll them with a rolling pin until they’re crushed. Put them into a small bowl and mix with 1 tablespoon honey. Put the sesame powder in a small bowl and mix with 1 tablespoon honey and pinch of salt. Take a piece (about 1 ounce) of white or purple dough and roll it into a ball in your hands. Work your thumb into the center of the ball to create a small cup out of it. Fill the cup with one of the fillings: beans, sesame seeds, or pine nuts. Seal it using your thumb and index finger and shape it into a half moon. You can leave it like that, or for some variation you can roll the half moon into a smooth ball and shape a little ridge on the top. Keep rolling and filling until all the dough is finished, about 12 to 14 songpyeon. 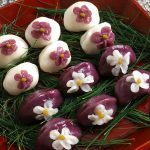 Leave about 1 ounce of white and purple dough for flower petals. Take a tiny amount of purple dough, about size of rice grain, and roll it into a ball with your fingers. Press the ball with your thumb and index finger to make a flat petal. Shape it into a petal. Gently attach the petal to a white songpyeon. Add four more petals to make a flower. Make a pistil with the yellow dough by rolling tiny amount of the dough and putting it in the center of the petals. Repeat with the rest of white, purple, and yellow dough. Add 2 inches of water to a large steamer and bring to a boil. Turn off the heat until we’re ready to steam. Line the steamer basket with a cotton cloth and fresh pine needles. Add all the songpyeon and put another cotton cloth on top of the basket and close the lid. This will stop water from dripping on the songpyeon while its being steamed. Turn on the heat to medium-high and steam for 30 minutes, then for 5 minutes at low heat. Remove from the heat and uncover. Let them cool for a few minutes, then take them out of the steamer with a spatula and a spoon. Brush each songpyeon with a little bit of sesame oil. Serve them by themselves, or with tea. Keep any leftovers in the freezer when the rice cake is still fresh and soft. When you serve them again thaw them out at room temperature or reheat them in the microwave oven. Posted on Monday, September 8th, 2008 at 8:12 am. Last updated on March 15, 2018. Posted September 24th, 2018 at 6:00 pm | Log in to reply. Posted October 3rd, 2018 at 8:23 am | Log in to reply. OMG I’m just finding this photo now. I’m so impressed by your tremendous effort to make such a beautiful artwork! Posted March 12th, 2018 at 4:04 am | Log in to reply. Hi Maangchi! I was really interested in one of the ingredients you used here: raspberry beans! I wanted to know more about them and looked them up, but was dismayed to find that the internet didn’t seem to understand what I was talking about, so I went to the dried bean database to figure out what you were referring to. Posted March 15th, 2018 at 9:06 am | Log in to reply. Yes, you are right! I tried to memorize the name of the beans when I bought them from the farmer’s market, but I guess I got confused by the time I came home! Thanks! Posted October 20th, 2017 at 1:35 pm | Log in to reply. I am wanting to buy a steamer like yours. How many quarts is your streamer? I want to make sure it is big enough. Posted October 11th, 2017 at 12:31 pm | Log in to reply. Posted November 15th, 2016 at 9:18 am | Log in to reply. How are you? I love your recipes! :) I’ve tried making bibimbap, kimchi and BBQ beef and they were all successful thanks to your recipes. Tomorrow i’m going to try making Gyeongdan 경단 and was wondering if i could use the filling that is used in Songpyeon 송편 in addition to the red bean filling. Will these fillings work in Gyeongdan 경단? It would be really helpful if you can get back to me asap. :) I really look forward to more recipes from you n the future and to try out all your recipes. Have a nice day! Posted November 22nd, 2016 at 2:18 am | Log in to reply. “Will these fillings work in Gyeongdan gyeongdan?” Yes, it will work well. Posted September 27th, 2015 at 9:51 pm | Log in to reply. My friend gave me an assortment of Songpyeon.. They are very nice.. May i know how long can we store them in fridge, and how do we heat it up? I received the rice cakes on Saturday, and i put them in the fridge after dinner time.. Do you think they are still ok to be eaten? Posted September 29th, 2015 at 10:33 am | Log in to reply. Any type of rice cake should be kept in the freezer when it’s still fresh. Otherwise, it will go hard easily at room temperature or in the fridge. But you can reheat it with microwave oven or steam it again if your rice cake turns hard. Posted October 4th, 2015 at 10:43 am | Log in to reply. Posted July 15th, 2015 at 8:54 am | Log in to reply. can`t find pine needles..what do i do?? Posted September 15th, 2014 at 5:10 pm | Log in to reply. My husband really likes 꿀떡. I want to make it for him soon, do you have any recipe for making 꿀떡? I would really be so happy if you have any suggestions! 감사합니다!! This recipe was originally posted on September 8, 2008 at 8:12 am by Maangchi. It was last updated on March 15, 2018. The video was watched 436,744 times on YouTube & has 12,855 likes! This video is a remade version of an earlier recipe. The original video was posted on 2008-09-08 and has 668,028 views.